Sturdy, well-built, and incredibly capable. This roaster has it all. Recommended for: Anyone who can make full use of its capacity. 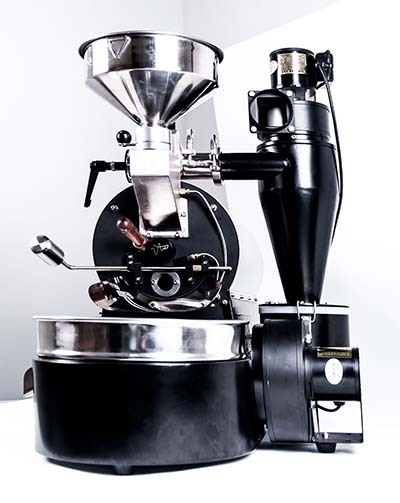 One of the most capable, small footprint, commercial-grade roasters on the market today. Well worth the price. Are you a member of a large household, filled with power coffee drinkers? Do you own a business that sells specialty coffee drinks to customers? Are you searching for the ultimate in coffee flavor? If you answered yes to any of those questions, then you’re going to love the ARC 800G roaster, and our in-depth review that follows. Make no mistake, this is a serious machine that falls on the extreme outer boundary of the “prosumer” product category. It’s probably overkill for all but the most extreme coffee drinkers and the largest households – unless you plan on home roasting for lots of friends and your extended family. It’s ideal for business use, though. If you are a manager of a busy office, run a B&B, or have your own coffee shop, then a machine like this can take your business to the next level. Because no matter how hard you search and no matter how many different coffees you experiment with, nothing can come close to the flavor that you get when you roast your own beans. 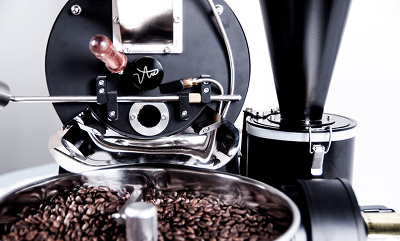 With those things in mind, let’s jump right in and see what this amazing roaster can do! 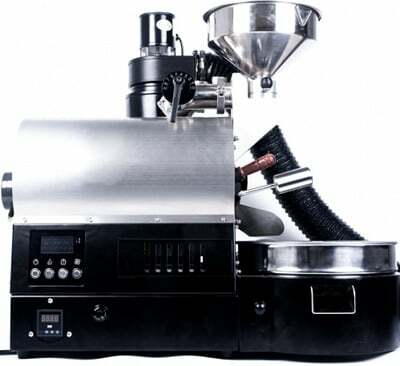 The ARC 800G Roaster measures 35” x 24” x 28”. It can fit comfortably in a large home kitchen, but probably only just. It’s solid steel, offered in matte black, red, or white, at your preference, and weighs in at a hefty 115 pounds, which is heavy enough that you’ll want to find a permanent home for it. Because, at that weight, it’s more than a little inconvenient to try to move around. Even if you don’t have a big kitchen, it could still work in a home setting. But its size and weight will probably demand that it find a home in your garage or workshop. It’s perfectly suited for business kitchens, though and will certainly make a handsome addition there. This is really the heart and soul of our ARC roaster review. The 800G has so many features and capabilities that it’s almost hard to know where to start. 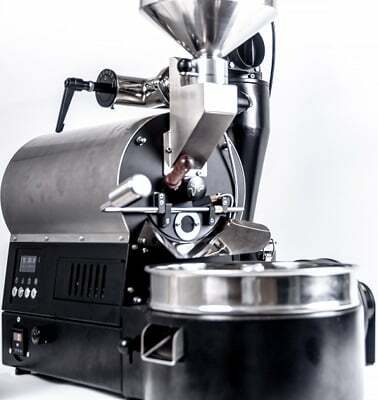 In terms of the basics, it’s a drum roaster with a variable-speed drum made of carbon steel and independently powered by a 25W motor that’s capable of handling test batches and sample roasts as small as 100g, all the way up to 800g (1.76 pounds) production runs. The cooling tray features an 11.8” diameter fan powered by a 50W motor for rapid cooling to minimize the time between production runs. Every aspect of the roasting process is under your control – from temperature, to the rotational speed of the drum, and stepless airflow control. Perhaps the best and most impressive of all, though, is the fact that the machine offers both USB and Bluetooth connectivity. Plus, each roast you do is automatically tracked via the Artisan roast profiling software, which is excellent. You can buy the machine in either gas (red or matte black) or electric (220V, red or white) configuration, so choose whichever makes the most sense for your business or home-based roasting operation. Be aware that most serious roasters prefer gas, for the same reason that most serious chefs prefer gas ranges. It just gives you a more precise, hands-on control over the temperature, which drives the entire roasting process. As mentioned in the section above, the ARC 800G roaster has a maximum capacity of 1.76 pounds. Although, the manufacturer’s recommended roasting volumes are 300g (10.6 ounces) or 600g (21.2 ounces). Even so, it’s entirely possible to go as little as 100g (3.5 ounces) to the aforementioned 800g (1.76 pounds), which is really amazing. While there are no presets, as mentioned earlier, if you connect the ARC to a computer, each roast you do will be tracked and profiled so you can easily start duplicating your efforts with the touch of a button. The controls are fairly straightforward and intuitive. Although, given the vast amount of control you have over the process, it would be false to say that there’s no learning curve. There is one, but it’s not so severe that you won’t be able to start roasting right away. Mostly it comes down to learning the machine and doing a few test batches to build some profiles and experiment before launching into full-scale production. While it would be overselling it to say that there’s no smoke when using this machine, with a 3” diameter flexible venting duct and an exhaust fan powered by a 45W motor, it’s easy enough to redirect the smoke so that it’s not an issue. This is another important part of our ARC 800G roaster review, and we give the machine high marks for its ease of use. Having said that, we’ll also note that it’s a bit like learning to play chess. You can learn the basics in a matter of minutes, but it is going to take you some time to truly master the machine. When viewed from a high altitude, the process is as simple as hooking the machine up, loading beans into the drum, and letting your eyes and nose guide you as your beans go through their color changes and progress through the first and second cracks. Depending on how dark you like your roasts, the process can take anywhere from eight to fifteen minutes. That top-level view misses a lot of details, though. And you’ll find that you’ll spend a lot of time fiddling with the controls and tinkering with airflow and temperature settings to get the roast exactly how you want it. First, you’ll want to keep your initial batches small (100g – 150g range) while you’re experimenting. From a practical standpoint, that’s a good idea so that if something goes wrong while you’re experimenting, you won’t lose that many beans. Second, you’ll definitely want to connect the roaster to a computer, either via the USB port or the Bluetooth wireless connection. Do that and every batch you roast will be logged and profiled. So, when you get it right, it’s a simple matter to reproduce it precisely. From there, using the machine is a snap! Chaff management is generally quite good. The roasting drum has perforations which allow the chaff to fall through and collect in a bin. But this only works well if you keep the drum clean and keep the perforations free of obstructions (chaff that didn’t fall all the way through). If you don’t conduct regular cleaning and maintenance, you’re bound to have problems on this front. Most commercial and industrial equipment are designed in such a way that cleaning and maintenance are fairly straightforward, and the 800G is no exception. All the major components are easy to get to, and it’s easy to tell at a glance when the machine needs a good cleaning. A good rule of thumb is to clean the unit after every 4-5 batches, or anytime you switch to a different bean. Although bear in mind that this is just a general guideline. You’ll need to clean the machine more often if you roast dark, and less often if you roast light. Trust your eyes, and take action as appropriate. We like almost everything about the 800G, and don’t see any significant negatives associated with it. It’s a bit pricey, especially for home use, which may put it out of the reach for some potential buyers. And although it’s sold by an American company, it’s made in China, so it doesn’t have the longevity as say, a German or Swiss-made machine. Mostly, we regard this as a self-selecting model. If you don’t have space for it, you won’t get it. If you can’t make full use of the volume it’s capable of roasting (or if you need even more capacity), you’ll naturally gravitate to a smaller (or a much larger) machine that’s more in line with your needs. For us, it hits the sweet spot of function and capability, and we like it very much. For everyone else, it’s almost certainly overkill, but still a really cool machine. Crop to Cup. Official Brand Website. Drum vs Fluid Bed Roasters. CoffeeChemistry.com. How to Roast Coffee for Beginners. Home Roast Coffee. Coffee Roasts from Light to Dark. Coffee Crossroads.